APRS display of the KH6WZ-5 location beacon at the 2013 OC Mini Maker Faire at UCI. Notice the beacon message at the top of the screen capture includes the URL of the event – a great publicity tool! First, “The Maker Movement” is nothing new, Amateur Radio operators have been doing this for a almost a century, and nearly 2 million people worldwide are involved in ham radio in some way. Second, Ham radio is not necessarily an old man’s hobby where weird guys talk to strangers from garages and basements. We are skilled wireless communicators and use today’s technology, from GPS and microprocessors to lasers and microwave frequency linking. This time I added static and working displays of my various APRS beacons (KH6WZ, KH6WZ-5, and others). I programmed the OC Mini Maker Faire’s URL to the beacon message so people can take a look at what was happening – an excellent publicity tool! I also planned on making some 10 GHz contacts with my rig, since this was also the same weekend as the ARRL 10 GHz and Up Contest. The transverter covers were removed so people can see the system’s guts. Based on previous experience at the Discovery Science Center “Meet the Makers” event, I demonstrated radio wave polarization- horizontal vs vertical – with my rig and the microwave strength meter. Since I had plenty of space, I shared my booth with a company that makes interesting computer and microprocessor related items. This may sound trivial, until you realize this company is run by these three young guys . 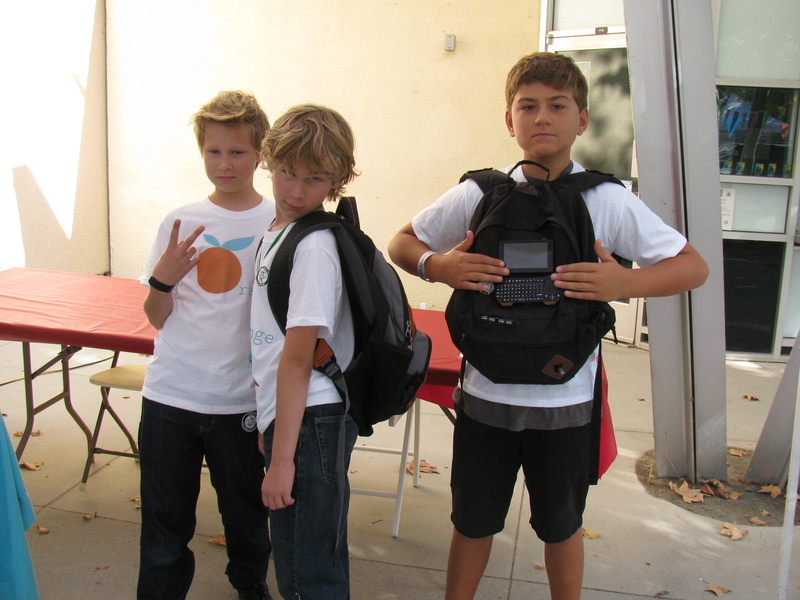 . .
Huxley, Max and Ethan showing one of their products called the SmartPac. There seemed to be more people at this Faire, probably since not too many other events were happening nearby. The 405/605/22 freeway closure did not affect the MF, since it started after the event ended. More than a dozen hams – either active or at least licensed – stopped by to visit. We talked about this event as well as the Bay Area Maker Faire, and what ham radio activities we are involved with. One more thing: I met several guys from the San Diego area – they are finalizing the plans to have a Mini Maker Faire in the San Diego area – this is great news. Stay tuned and I will announce an update as soon as I hear something from the committee! Here are some pictures from the event. I am already thinking of building some new displays for next year. The 24-inch M/A-COM dish with the KH6WZ logo makes a pretty decent sign for the booth, eh? The KH6WZ APRS beacon (unit 1) at the OC Mini Maker Faire 2013. This was a static display unit to show components and construction. 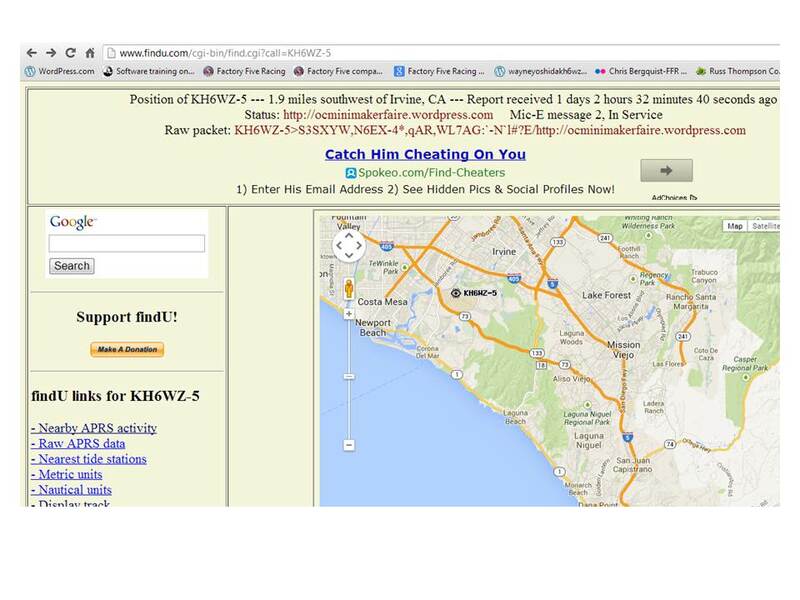 KH6WZ-5 APRS beacon – active and sending position data at the 2013 OC Mini Maker Faire at UCI. The beacon message included the Faire’s URL. This familiar unit makes an appearance at the Maker Faire. . . The robot “Titan” was a crowd pleaser – it throws flying discs and comes to you for a refill. Track Roamer robot at the OC Mini Maker Faire. Notice the Nerf gun. When you come to next year’s event, remember to wear a red shirt. One of the “roving displays” at the OC Mini Maker Faire 2013. Some ham visitors at the Orange County Mini Maker Faire 2013: Haliey, Michelle W5NYV, Paul KB5MU and John KJ6HZ. Michelle W5NYV wearing her daughter’s alpha wave ears. The ears move and react to pulses from a sensor clipped to her left ear. An unknown couple wearing Vocademy shirts. What a great slogan: Eat, Sleep, Make.